I have this amazing, very, large canvas of Bessie the Cow in my office, hanging on the wall over my grey leather IKEA therapy couch. I know, Really. 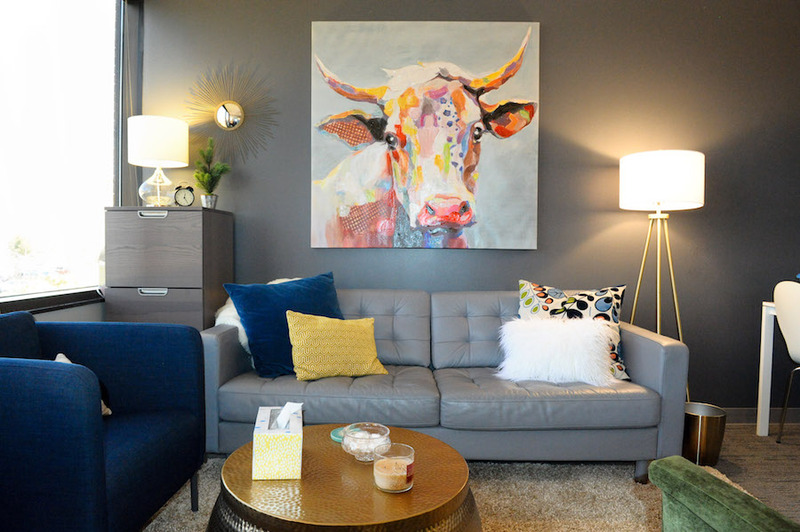 Why would a therapist hang a canvas of a colorful cow in her office. Well, in all honesty, it’s because I just love it, and it’s really important for me to fill my space with things that bring me joy. After all, why wouldn’t I do that if I had a choice? I used to not have a choice because I worked for other people in their offices in the past, but now that I have my own, I get to decorate it in a way that reflects me. So, Bessie is hanging over my couch where I get to see her all day long. I love that Bessie is fun. I love that Bessie is comforting. I love that Bessie is relaxed. I love that Bessie sets the stage for my office to be fun, comfortable and relaxed. Because that’s what I want you to do – have fun, be comfortable and relax. And yes, I realize fun is relative in a therapist’s office. I love that Bessie is colorful and I love her soft eyes that look sad and peaceful and content all at the same time. Because I think that we can hold all sorts of emotions and be ok. We can be sad and still be peaceful and content. Life is very sad for all of us at times in our lives. It’s so important that we learn to acknowledge and accept our feelings. If we don’t own our feelings, then they will own us. The funny thing is that I chose Bessie just because she reflects my style and she speaks to me. I didn’t choose her because she would be a marketing tool. But I have had multiple clients tell me that they chose me out of the bazillion therapists they found online in Kansas City because they loved that I had a cow on the wall. They usually say something about believing that a therapist that had a cow on the wall would be fun and down to earth. And then they smile a big grin and their eyes light up. I just love that. EFT Couple’s Therapy – What is it? Do you need marriage counseling?